It’s springtime. Pollen is in the air. Lots of it. Your car is coated with it, and you can’t sit on your patio furniture without having a backside covered in it. Many people deal with seasonal allergies every year. They know the drill. On the other hand, you may have never had outdoor allergies in your life. But don’t be fooled, adults are newly diagnosed with allergies on a regular basis. “Maybe it’s just a cold,” you say to yourself. It seems a lot like a cold. The symptoms are awfully similar. And June from work has it, too. So how do you tell the difference between a cold and allergies? In response to allergens, your mucous membranes become more productive. Allergens provoke your body to create mucus with histamine which leads to swelling of the nasal passage and production of clear, watery drainage. This does not include gunky, green, globs. Yellow, red, or brown doesn’t count either. In the beginning, your symptoms will be really bad, but your symptoms will stay the same far beyond the normal window of a cold. In fact, they stay the whole entire time the allergen is in the air. For instance, ragweed or grass pollen can linger for six weeks. This may be the most uncomfortable allergy symptom for some folks. Your eyes release histamine when they come into contact with pollen floating in the air. Then they turn red and beg to be itched. Your lacrimal glands produce fluid to attempt to rid your eyes of the allergen. It’s common to sneeze with colds, too, but you’ll notice that sneezing with allergies accompanies you going outside, and not necessarily inside. If there’s an open window or door, then you’re likely to sneeze inside. But most of the time, your sneezing occurs when you’re in close contact with the allergens. Like with sneezing, you know it’s allergies if your symptoms get worse depending on where you are. It’s not just sneezing, but all of these symptoms. If you’re out for a picnic and you notice your symptoms flaring up, then it’s allergies. Although fever isn’t super common for most people, some individuals do get a mild increase in temperature. You know if you’re having a fever, then it’s definitely not allergies. Again, not always common with colds but because it’s a viral infection, your body may experience aches and discomfort as it tries to heal. Mild aches is not a thing for allergies. What’s tricky here is that nasal discharge with a cold can be watery in the beginning, like allergies. But as the days progress, your discharge will become thick and, most of the time, green. That’s when a neti pot comes in handy! The average cold lasts seven to 10 days with varying degrees of symptoms. Usually, your symptoms start with a sore throat that resolves and leads to congestion and nasal discharge. The absolute maximum length of time for a cold is two weeks. Anything more than that is either allergies or more serious infection that needs to be addressed by your physician. 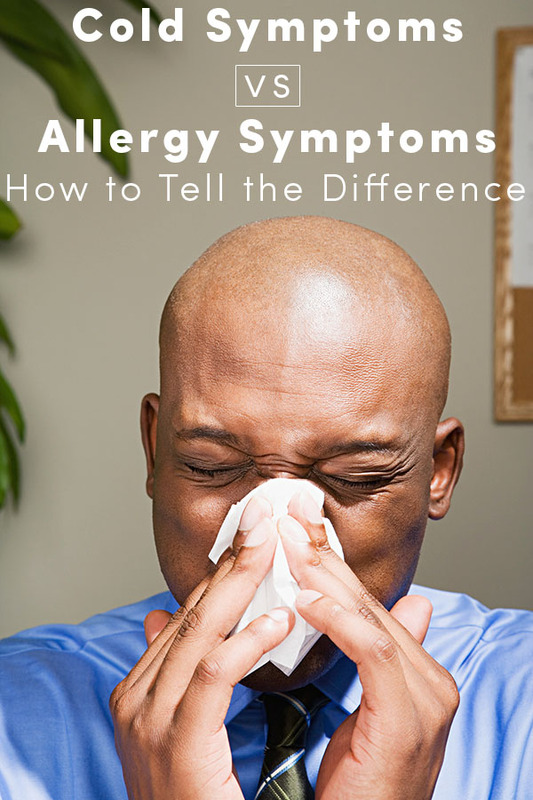 Despite the differences, you’ll treat a cold or allergies exactly the same way. Lay on the nasal decongestants, steroids, and antihistamines, or whatever natural remedies you favor. If you have a cold, you’ll want to rest and heal. With allergies, you’ll simply need to be patient and avoid the allergen, which can be a bummer when it’s so beautiful outside this time of year.